Situated In The Award Winning Waterford, This Bright & Spacious 1 Bedroom Plus Den Corner Unit Features Dark Rich Hardwood Floors.Stainless Steel Appliances,Granite Countertops,Glass Backsplash & Upgraded Cupboards.Potlights & Crown Moulding, Deep Soaker Jacuzzi Tub. 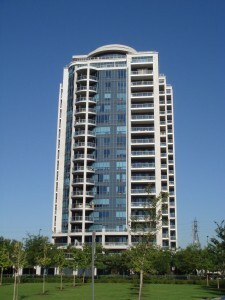 2 Walk Outs To The Large Balcony, Gas Hook Up For BBQ, Ample Closet Space.Carefree Living In This Executive Building. Parking And Locker. TTC At Door. Steps To The Lake & Trails.